Universal aspirations never cease to exist. It is as if we were condemned to universality, especially so since the photographic view of planet Earth from outside its biosphere was published. The networked society of wireless communication, in which many of us live today, brings together “our central nervous systems in a global embrace, abolishing both space and time as far as our planet is concerned”.1 Note the use of the possessive pronoun “our”, which already implies an understanding of the sphere that “we” inhabit as a shared property. Universalism is closely linked to traditions of humanism (as an attempt to consider what binds rather than separates “us”). 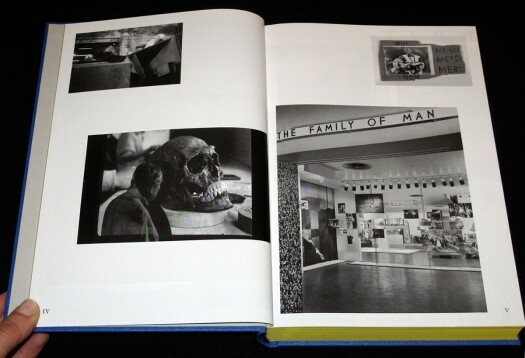 The largest and, in terms of number of visitors, most successful photo exhibition to date is “The Family of Man”, curated by Edward Steichen and first shown in 1955 at the Museum of Modern Art in New York. It was a bold humanist and universalist statement claiming the “fundamental equality of mankind, expressed through the humanist photography of the post-war years”.2 The exhibition juxtaposed 503 photographs by 273 “artists” from 68 countries under general categories like “work” and “family” in an exhibition layout considered experimental at the time—with many free-floating images in different sizes, as a sort of three-dimensional photo essay. The show sought to convey “a message of peace in the midst of the Cold War”, as asserted in a statement on “The Family of Man” website from the Steichen Collections in Luxembourg, where the exhibition has been installed permanently in the Clervaux Castle since 1994. In The Human Snapshot, Ariella Azoulay’s essay “‘The Family of Man’: A Visual Universal Declaration of Human Rights” argues against Barthes, however precise and compelling she deems his arguments, and proposes a reassessment of the universal appeal of “The Family of Man”. Does this re-evaluation, after the fall of Soviet communism, then fall into the trap of uncritically singing the praise of liberal capitalism, the supposed victor of the Cold War? Since 1991, modern Western democracies have been immersed in deep crisis, with democratic values like plurality, indeterminacy, and dissent under increasing pressure from imposed needs of efficiency. What kind of universal civil contract does Azoulay ask us to imagine in between the photographs that are juxtaposed in “The Family of Man”? Instead of reading universality as described in the photographs, Azoulay requests that we regard them as prescriptive through the plurality of the photographed situations and their juxtapositions, thereby shifting universality as an essence (as something we can discover and know) to the universal as a category of ethics and the imagination. The written “Universal Declaration” is no different, being prescriptive for, and not descriptive of, human affairs. Steichen didn’t seem to actually intend for his exhibition to be descriptive, nor does he appear to have chosen the photographs for their descriptive qualities. The problem with photography would seem to be its inherent ambiguity. On the one hand, a photograph is very much inscribed in history (in Barthian terms, as an index or punctum), yet on the other, it is very often assumed to be of universal appeal, as a “language” to be understood by everyone. This iconic side of photography’s currency, aspiring to the studium or general knowledge, is what prevails in “The Family of Man”. The photographs in the exhibition are barely explained by context. Azoulay’s essay is the opening contribution to The Human Snapshot, a collection of sixteen essays bound in an elegant and classically designed book—the outcome of a conference, held in Arles (FR) in 2011, taking Azoulay’s research into “The Family of Man” exhibition and its critical legacy as a point of departure for debate on humanism, universalism, the effects of the global distribution of images, and their impact on human right issues. The majority of contributors do not reflect directly on “The Family of Man”; instead, their essays deal with the paradigm of modernist architectural photography, the politics of spectatorship, the notion of the common, with forensics as “human rights for the dead” (victims of violations of human rights), humanist correspondence, the precariat (the new proletariat of the unsettled middle class), and the art of Thomas Hirschhorn, whose work is surprisingly productive when it comes to rigorous and adventurous writing about the topics central to The Human Snapshot. Katya Sander in particular reacts directly to Azoulay, asking “what do we make ourselves guilty of, when we look at images?” (p. 151) in response to Azoulay’s proposal to include in a universal declaration the “right not to be a perpetrator”, a right that is violated each time someone falls victim. Sander attempts to answer the question through the new paradigm of spectatorship established by Conceptual art, after which she comes up with more intriguing questions, including: “Has spectatorship become the empty signifier claiming universality?” (p. 157). In her proposal for a revaluation of Steichen’s ideology, Azoulay displays a somewhat naive belief in a “universal language” of photography. Nevertheless, she professes an open-ended dialogue, in words provoked by and in between images; precisely the sort of exchange that is, in part, constitutive of democratic forms of society. And this type of open exchange is a precondition for such an abstraction as a universal declaration (which Azoulay notes should be a palimpsest). What does it mean to be human? And what does it mean, as a human being, to have rights? The conference and its valuable and insightful essays formulate tentative answers to these questions, in relation to representation, because issues of such a “monolithic” (Hilal and Petti, p. 133) abstraction can only be made tangible through representation, just as we find ourselves represented in legislative and political bodies—turning us from Man into men. It is still hard to imagine what a “visual universal declaration” of human rights would really entail. “The Family of Man” is and remains a photographic declaration rooted in the 1950s, envisioned by an American who believed in a universal message of peace during the heyday of McCarthy’s anti-communist crusade. How viable is such a visual declaration for the civil imagination of, say, Palestinians? In practice, photography comes to life, feeds debates, and obtains meaning when embedded in discourse, whether in daily speech in the various regional and national languages or the global academic English as used in The Human Snapshot. This exemplary publication—recasting the debate on photography (and other media) in the light of the political—fortunately provides wide margins for extensive annotations. 1 Marshall McLuhan, cited in James Gleick, The Information: A History, A Theory, A Flood (London: Fourth Estate, 2011), p. 413. 2 “The Family of Man at Clervaux Castle”, http://www.steichencollections.lu/en/The-Family-of-Man, accessed 3 February 2014. 3 Allan Sekula, “The Traffic in Photographs”, in Julien Stallabrass (ed. ), Documentary (Cambridge: MIT Press, 2013), pp. 89–97, esp. p. 94. 4 Roland Barthes, Mythologies (1972; repr., New York: Hill and Wang, 1991), p. 101. Thomas Keenan and Tirdad Zolghadr (eds.) – The Human Snapshot, LUMA Foundation, Feldmeilen; Center for Curatorial Studies, Bard College, Annandale-on-Hudson, NY; Sternberg Press, Berlin 2013 / With contributions by Ariella Azoulay, Roger M. Buergel, George Didi-Huberman, Anselm Franke, Dominique Gonzalez-Foerster, Marion von Osten, Hito Steyerl, and Eyal Weizman, a.o. *This book review appeared in Camera Austria International No. 125, March 2014, pp. 93-95.